The continued use and production of thin plastics is said to cause more harm than good that if the country is not careful it will have no fish stocks in Lake Malawi by 2050, according to findings from an independent assessment. This was revealed by the spokesperson of Malawi Parliamentary Conservation Caucus (MPPC) Commodius Nyirenda and MPCC Co-Chair Alex Meja during a news conference that took place in Lilongwe. Findings from an independent assessment commissioned by the Malawi government with support from UNDP and Lilongwe Wildlife Trust also unearthed negative social, environmental and economic impacts of plastics pollution. According to Meja and Nyirenda, an estimated 75 000 tons of plastic is currently produced in Malawi each year, of which 80 per cent is single useplastic that cannot be recycled. It was also revealed during the meeting that plastic production has roughly doubled globally in the past 30 years with 3000 million tons of plastic waste being produced every year, almost equivalent to the weight of the entire human population. Said Nyirenda: "The evidence is crystal clear. If thin plastics use continues unabated we can expect degraded soils, reduced fish stocks, worsening crop yields, increased floods, declining human health and losses in tourism revenue." Nyirenda then called on Malawians to desist using thin plastics because they are not easily degradable and end up in our rivers and eventually lakes. "There is evidence that fish is failing to multiply because of the presence of plastics in Lake Malawi which is sometimes ingested unknowingly and affects spawning. If we are not pro-active even the tourism sector will be negatively affected since tourists come to see rare species of fish that cannot be found anywhere else in the world,' said Nyirenda. Nyirenda added that if the fish in Lake Malawi dwindles then millions if not thousands of fishers along the lake will have their livelihood completely compromised as they will have nothing to do. Meja concurred with Nyirenda that by 2050 negative effects of plastics will reverberate across the country as many people especially fishers in Lake Malawi will be toiling in vain. Professor Sosten Chiotha, who is the Regional Director for Leadership for Environmental Development, explained in an interview with Nyasa Times that the presence of thin plastic bags is of huge concern to everybody because they affect nature. Chiotha disclosed that recently his organization engaged Malawi army divers to collect trash in Lake Malawi and the soldiers ended up collecting moreplastics. "We have evidence that some fish if you dissect them they have plastics in their gut. This is dangerous and affects reproduction systems of the fish. 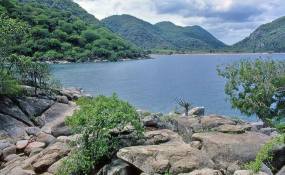 Even then quality of water if we persist using thin plastics will be compromised and eventually we lose revenue from tourism as the Lake will no longer be attractive," he added. Spokesperson for Lilongwe Wildlife Trust Elaine Hake whose organization works to protect Malawi's biodiversity for the benefit of the nation and wildlife also called for drastic action on those still producing thin plastics. "Thin plastics are a danger that we need to do away with, the sooner the better. As LWT we have been appointed by government to administer a number of national wildlife trade, deforestation, justice and advocacy initiatives. In collaboration with local and international partners, LWT responds to urgent conservation challenges as well as drive long term social and institutional change across a number of areas including illegal wildlife trade, deforestation and plastic solution," explained Hake. Portfolio Manager for Resilience and Sustainable Growth at UNDP Andrew Spezowka said tackling plastic pollution is crucial to achieveing sustainable development and that is the reason why this issue is woven into the UN's sustainable development goals. "The government of Malawi has demonstrated its progressive approach to environmental protection by banning thin plastics in 2014 and we welcome Malawi joining the growing number of countries across Africa that are tackling plastic pollution and upholding a common vision for a cleaner, safer and more prosperous future," he said. The international community have recognized the urgency and gravity of the matter and as of March 2019, lightweight plastics have been introduced in 62 countries. Last month the European Union voted to ban single-use plastics across Europe by 2021.